GOOD ONYA Tyger!! CONGRATULATIONS fastpassage39! The SSANZ Two-handed Triple Series is one of Sailonline’s all-time favourites. The combination of three middle-distance inshore races with the waters of the Hauraki Gulf and the competition from the real racers of the Young 88 Association really makes this a truly must-do series! For Europeans it is a big ask, as the races all start very late in the European day, so a reliance on DCs (or a preparedness to forego sleep) are the only choices. For the rest of the world, this has the potential to be really challenging and so it is unsurprising to find our podium three coming from Brazil, Australia and USA. The course for this SSANZ60 was a little different this year and the wind gods were certainly smiling on everyone taking part as the winds permitted a reasonable broad reach to the first turn at the Tiri Navy Buoy. From here to Gannet Rock, while definitely DC-able (risking an overnight wind update!) the optimal course included some judicious manoeuvring for best VMG. A few Europeans, by this point, were either beached overnight or sailing relatively randomly, but the competition for the top spots was still pretty full-on with nearly 9 boats arriving in the first 10 minutes. The real fleet was tracked in real-time and this gave a sense of just where we and our virtual Young 88s were in the field. 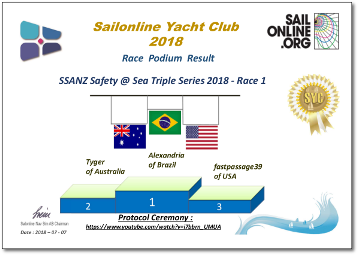 The SSANZ Results show that the best corrected time for the Young 88 start, S/Y Skitzo was 6h 53m 29s while Alexandria arrived at 8h 10m 1s. This time it would see that the local tides/currents cut in favour of our IRL opposition! Congratulations to our podium for a great start to this year’s series!